Blizzard gift electronic certificate is designed to replenish the balance of a Blizzard wallet for 500 rubles. 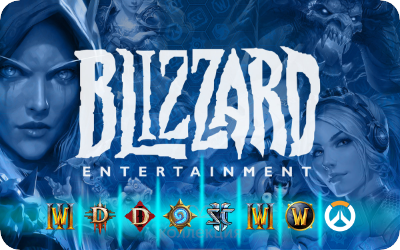 Funds on the account of the wallet in the Blizzard Shop can be used to buy electronic versions of games and add to them, in-game items, game time, payment for services for characters and other useful services. As soon as the purse in Blizzard is replenished, you can spend money on any of the services within the game. My contacts Telegram and email. mail are on the page "Information about the seller and its products." For any questions you may contact me through these contacts or in a personal message here on the site. 2. Log in to your account. If you do not have an account, create one. 3. Enter and redeem the code you purchased. !!! ONLY FOR THE REGION RU - RUSSIA !!! Pay attention to the regional identity of the electronic code. When replenishing a Blizzard wallet with electronic codes, regional affiliation of a Blizzard account matters. The currency and region of the gift card must match the currency and region of your Blizzard account. Carefully make a choice and purchase of electronic codes to replenish your Blizzard account!